Express2PCC is a second generations ExpressCard to PCMCIA PC Card and CardBus adapter. Express2PCC was designed to provide backward compatibility for the new generation of ExpressCard equipped laptops to legacy PCMCIA 32-Bit PC CardBus and 16-Bit PC Cards. Express2PCC seamlessly converts data at the highest throughput speed from PC Cards designed for cellular broadband, wireless networking, video, audio and memory expansion to the new ExpressCard format. It is especially useful for videographers utilizing Panasonic P2 cards, allowing card ingestion on newer ExpressCard based notebooks. Special care went into designing the Express2PCC's timing circuitry in order to avoid clumsy A/B switches and other incompatibility issues seen with first generation ExpressCard to PCMCIA PC Card and CardBus adapters. What's more Express2PCC requires no drivers on any of it's supported systems! 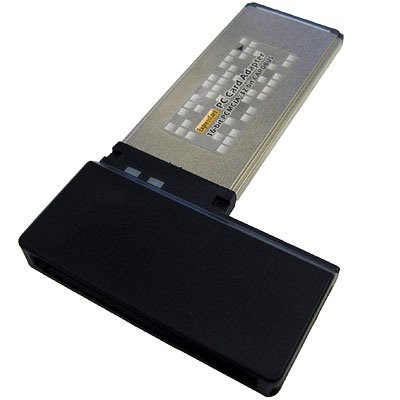 Using special electronics to convert PCMCIA PC Card input to ExpressCard compatible signals, the adapter can reach transfer rates up to the full 2.5Gbit/sec supported by the ExpressCard interface. The adapter works with ExpressCard equipped laptops or desktops. Installation is a snap and the Express2PCC has been tested with a wide range of existing PC Cards including: Panasonic P2 cards, and 3G wireless cards from Sprint, Cingular, T-Mobile, and Verizon. If the drivers exist on a supported platform for a specific PC Card, then it should work in the Express2PCC without any issues.